Well, its taken me awhile to write this post, and I figured it might. There was a lot of processing that needed to be in in regards to my Europe trip. I wanted to give myself enough to time to adjust to being back at home and also to really reflect on everything that happened. This isn’t a post to recount details of the missing portions of the trip, refering to that space between my initial time in Berlin and the trip home. Those may or may not be covered in SB’s blog (depending on her procrastination), and my time recounting specifics has come to an end. So what do I have to say? Well, Semisonic sort of said it best, which is I chose to open with that verse. 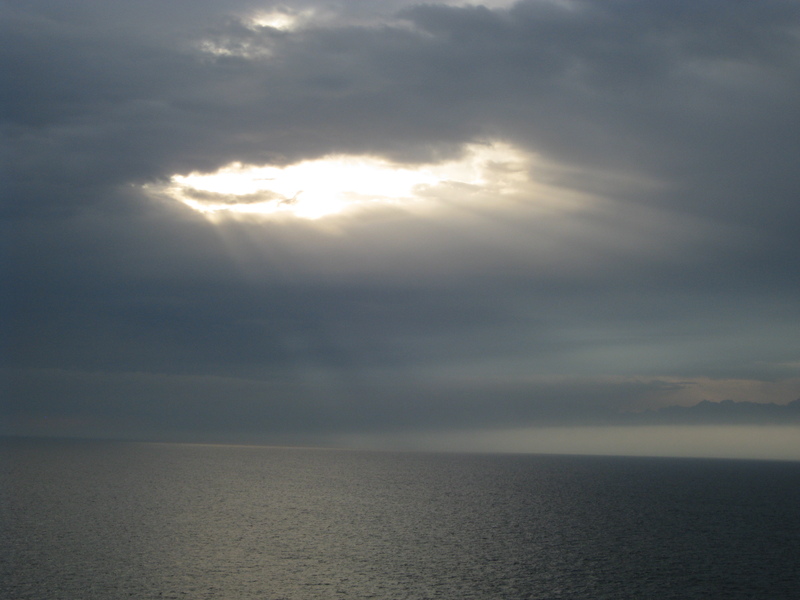 Europe was both the end of a certain phase of my life, as well as the beginning of another. The past year has been exponentially rough for me, for a myriad of reasons both known and private. Europe was an opportunity to remove myself from everything I knew and completely jump into an environment in which I was absolutely, totally, alone. And I survived, I came out stronger than when I went in. There were times when I was genuinely upset, times when I was nervous, heck even scared, and there were certainly times when I was angry, but it all formed some large and complex experience that I’ve never had the chance to appreciate anything like before. I’ve lived in a socialistic country, I’ve sailed the Scandinavian coasts in a 200 year old vessel, I’ve rode in a train controlled only by a computer, I’ve traversed palaces and parliaments, I’ve kayaked in the North Sea, walked in the footsteps of my ancestors, scaled the steps of fortresses, celebrated ancient traditions in the Danish countryside, gazed upon the fjords of Norway, stood in a Swedish church dating back a millennium, seen the resting place of an entire monarchy, seen multitudes of the largest collections of the finest alcohols in the world, stood in the very spot where Hitler outlined his plans for Europe, followed the Soviet path through the final advance in Berlin, touched the Berlin wall, stood inside the gas chambers of Dachau and witnessed the same scenery that the 1.5 million victims of Auschwitz would have seen in their final moments of life, I’ve rode a train at 175mph, I’ve seen the Bavarian Alps, relaxed on the same balcony as Hitler, ate inside the roar of a German beer hall, walked the grassy knolls of the Tier and Englischer gartens, seen a rainbow above the fields of Poland, stood at the monument for Grunwald, traversed countless cobbled roads, and stood above the very spot where the war that claimed over 50 million lives came to a sudden, jarring, stop. And that’s only scratching the surface. What would I do different? Well, by and large I was extremely satisfied with my time in Europe, but hindsight is always 20/20 and naturally there are a few things I would change. Firstly, more time, though I wonder if there is every such a thing as enough time to be honest. I’d have loved to have spent more time in all of the countries, even Denmark since I wasn’t able to see hardly any of Jutland. Beyond simply wanting more time, I would have definitely went about my enrollment in DIS differently. For one, I would probably have cut them out entirely and just directly enrolled into the University of Copenhagen myself. Also, I’d have arranged my own housing in a kollegium of my choice. DIS is a good program, but they weren’t a good program for me. That being said, I don’t regret anything, but if I were to ever do it again, I think I’d go the entirely individual route and leave programs such as DIS for the people who were far more interested in acting like they were 12 years old. I’d also pack less, truth be told, I packed less than any other American I encountered, but I could still do much, much less. I was able to make 1 pair of underwear last 7 days in Denmark because I didn’t really sweat, so 4 pairs could have lasted me a month. Sound gross? Well, it really isn’t. And when your entire life needs to be extremely mobile, fitting everything you need into one backpack provides immeasurable benefits, I now know this first hand. As for whether or not I will go back, I will of course respond that its not a matter of if it is a matter of when. I am certainly a more knowledgeable traveler this time around, and I’ve also proven that I am quite capable of planning out very detailed itineraries if needed, including situations in which their is a massive language barrier (For the record the entirety of the vacation portion of the trip was planned by yours truly, and everything went off without any real issue). I’d like a more thorough trip of the British Isles, and I’d also like to see Italy and Greece (though Greece needs to calm down a bit first). There’s also huge swaths of the places I have been that need seeing, so there’s so much to do and thankfully still plenty of time for doing it. Now I will say that I never had much desire to live anyplace I visited, that is until I went to Scotland, but that’s a non-issue until they possibly gain their independence in 2016. So while I have no immediate plans to hop on a plane and disappear off into the European countryside, I will definitely be going back, and who knows what the long term will bring, but I’m looking forward to it for the first time in a good while, and that’s really all that matters. I will say that I’m likely done with my current area though, no hard feelings, it will always be home, but I sincerely believe that this coming year will be my last in this area, and thankfully SB has the same idea. Of course that may change entirely, but I think I am ready for some new horizons, once you’ve seen whats out there, its very hard to be content with the roads you’ve always known.What’s nice about the U.S. is that its a big, big country (trust me you have no idea how “big” the U.S. is until you are outside looking in), so there’s lots of places to settle that aren’t so extreme as Europe. But, as mentioned, a lot of that depends on what happens once I am done at Purdue. And with all of that said, I think I’m going to go ahead and cut this post off. Sure, its a little shorter than many of my other posts, and there’s no tidbit of the day to end it on a humorous note, but then again, who said recollecting something had to be a terminus, I’d rather like to think of it as the beginning of something new entirely. I won’t be updating the blog anytime soon, at least I have no plans to, but it will be here, prepped and ready for whatever lies ahead. 🙂 So to future me, remember everything contained in this blog thus far and pay special attention to whats written between the lines, as only you can see it! To everyone else, thanks for following along and dealing with what I’m sure has been a endless deluge of grammatical and spelling errors, but as I said in the beginning, deal with it, haha. Alright, so I am literally on the clock. My 4 year old laptop battery doesn’t last nearly as long as it used to and the hostel failed to mention the internet requires you to be in the lobby. Not a huge deal, but it makes it hard to be online for very long. Additionally, the wireless itself is sketchy, last night it was literally running slower than dial-up from 1995. So don’t expect much in the way of pictures, or length. The flight from Copenhagen was pretty uneventful, there was a 20 minutes delay because the radio had to be replaced, and then some turbulence from the low cloud covers (getting to see the wings cutting the dense clouds was actually pretty sweet), but other than that, no large issues. When I landed in Berlin it was sprinkling, but nothing too heavy. Tegel airport ehm.. leaves much to be desired in the way of helping you navigate. See, I know a little German, but the thing is, the signs aren’t in Germany, they are just pictures. And not only are they just pictures, they are really, really confusing pictures. For instance, an ATM machine is a person holding a tiny, tiny square thing (it looks like a person holding a suitcase). And buses, well, it just lists the bus route, so if you don’t know what route you need, its kind of rough. But I managed, obviously. First interactions with Germans were not so pleasant, or maybe I’m just used to the reserved Danes by now, so that the in-your-face Germans are creating some culture shock. Additionally, these were airport and transport people, so they are normally mean anywhere you go. I found the bus I needed, TXL, which ended up being a horrific experience. Essentially, Tegel airport has no rail connections, so you HAVE to take a bus (or Taxis). The main bus that goes to the Hauptbahnhof (Central Station) is TXL. Well, it started pouring, and there were at least 2x as many people on the bus as it was designed to carry. Never in my entire life have I been so cramped on a bus, ever. People were literally on top of each other, and I do mean literally. The rain was also coming in the windows and vents, which no one could reach to close since it was so cramped. Once I got the station I was more than happy to get rained on. I thought I got lost on the way to the hostel, but turns out it was just further down the street than I thought it was (or they advertised). Check in went smoothly, they spoke fairly decent English, and I went and unpacked. Later I went back to the station for some food, as, and I cannot emphasize this enough, the station is freaking massive. Since then I’ve done a lot of walking around, scouting us places for SB and I to go to. The only thing I’ve really done as far as going in someplace is touring the Reichstag (Think of it as German Parliament). The famous glass dome at the top is closing for the entirety of this week for cleaning, so I literally slipped into one of the very last tours. SB won’t be able to go up into the dome, but that’s what she gets for going to a beach in Grenada. Tough Tooties. Outside of that, I’ve really just been checking things out and getting oriented as mentioned. After studying Germany for two years I’ve been able to navigate the city largely without a map. Which is good, because maps make you a target, and beggars and thieves are everywhere here. In fact, within 30 seconds of entering the central station the first time I was practically mobbed by Turkish women wanting money for their children. Its a huge scam, and I knew about it, and they even followed the exact pattern I figured they would. No big deal until they tried to grab my backpack, but brushing them away works wonders, I think most people are too passive and therefore give them money and probably get pick-pocketed by their children (thieves in training) in the process. The weather has been mixed, its either GORGEOUS or pouring and humid (I’ve also been dying in the 80 degree temperatures, those of you at home may laugh, but spend 6 weeks in the 60s with no humidity and the 80s seem like an inferno, also there is no AC here and the hostel window doesn’t open very far). I had to buy a new umbrella, mine literally snapped in half the first time I used it here. Purchasing it was my first full exchange in the German language, and it went smoothly. However, not all conversations are as easy as that one and I tend to stick to English whenever possible just to prevent massive confusion. The hostel hasn’t been too bad, but being my first hostel there is some adjusting that must be done, such as it being really crowded in all the public areas and always being loud. The first night wasn’t too bad, but then a group of 60+, 10-13 year old English children came and they spend most of their times running along the hallways randomly banging on doors then scurrying away in a trail of laughter. But all in all, its not bad. Especially since breakfast is supposed to cost money, but the past two days no one has been at the door, so its just been completely free. Its standard Continental fare, and no where near the quality of the Scottish hotel’s food. But for today, I will be attempting to get back to Tegel to pick up SB this evening. Based on the complexity of the signs, and the lack of English (bus drivers speak none) I’m worried she’ll end up in Prague or someplace. I think I’ve figured out a way we can bypass the TXL bus, which I’m sure will be even worse with her larger suitcase. I’m looking forward to really getting started with being a tourist tomorrow and for showing SB some of the good food (Doner, Currywurst) as well as the places I’ve found. If it sounds like I’m cutting short, its because I am, my laptop is about to die. That and the French kids next to me are becoming increasingly annoying (i.e. being French). Not sure when I’ll update next, it depends on time and internet. But all is well in Berlin, and I’ve already had two beers I’ve never had before, so I’m off to a good start! 🙂 My only qualm is that maps are not free here, I spent two hours trying to find a free one, and nope, they do not exist. The Police also have a MUCH larger presence here than in Copenhagen, but that’s not inherently a bad thing. Loving the history though, oh man, so much stuff everywhere. 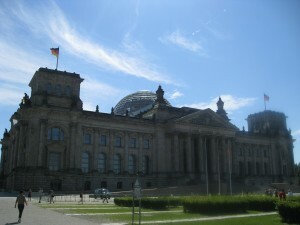 Enjoy this one picture of the Reichstag, it took me 13 minutes to upload it.